Home / Parenting24seven / 6 - 12 Years / Buy Well, Be Well, Eat Well / How can I encourage healthy eating? Q. I know what my children should be eating, but my question is how do you actually get them to eat healthy foods? I have two boys aged two and five and though they are not the worst in what they eat, there is still a lot to be desired. For example, my five year old almost never eats the dinners we have as adults and his diet is restricted to mainly eating pasta and bread. He hates food that has ‘bits’ in it and will spit out anything he does not like. He does have the occasional apple (and this is the only fruit or vegetable he eats) and luckily he eats porridge in the morning with me. But apart from that he won’t eat any new foods I give him and it often ends up in a row. I would love him to eat more vegetables and to have dinners with us. What can we do? A. Fostering healthy eating choices in children is a long-term project that can be marked by setbacks and frustrations. Frequently, young children can have a very limited range of preferred foods compared with adults. Like your own son, many children resist eating family dinners and instead want to eat only the foods they are familiar with – this is understandably frustrating for you as a parent. The good news is that there is a lot you can do as a parent to gradually expand a child’s food repertoire, though it does take patience and persistence. The first step is to observe closely and make an inventory of the amounts and types of foods your son eats. Frequently, although it might be restricted to certain foods, some children can have a relatively balanced and healthy diet that covers most of the food groups. As you describe, your son does currently eat a lot of healthy foods (such as apples, pasta and porridge). Secondly, it is important to try to understand the source of your child’s resistance to eating certain foods. Some children are averse to certain flavours or tastes but frequently children can be very sensitive to other aspects of food such as the texture, size, consistency and temperature. This may be the case with your son as he does not like the “bits” in some food. 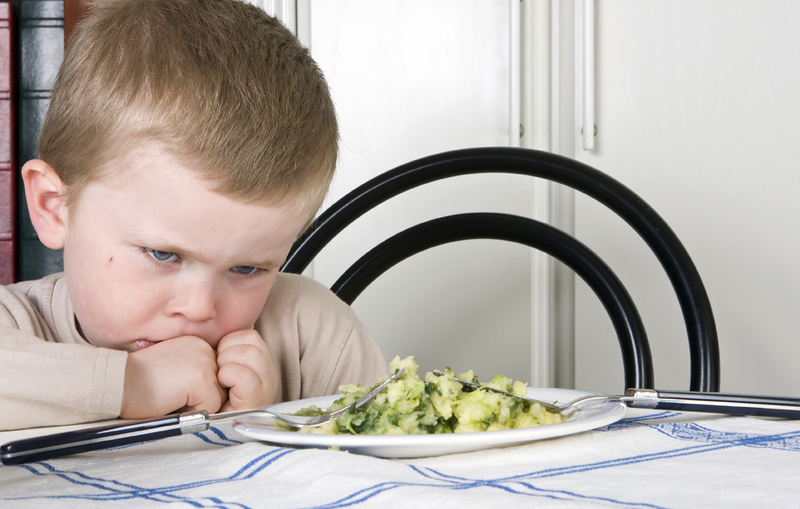 In addition, if a child has had a bad experience with a certain food, when they gagged or spat it out, this gives them negative associations that make it hard to try the food again. The key to making progress is to start with food that your son likes and then to gradually expand these out to include new foods. Be extremely patient and positive when you introduce new foods and make sure to go at your son’s pace. You might expect him to tolerate only a small portion on his plate, before he smells it or tastes it (without putting it fully in his mouth), and so on. Though it is really hard, try to always be encouraging, positive and upbeat. The temptation is to criticise, cajole or even to force a child to eat but these are counter-productive strategies that can set you back (and can even invoke a “gag” response in your child). Instead, always focus on what your son is doing right, “you had a taste of that – well done” or to gently encourage him “well done, only one spoon to go”. Sometimes it is best not to mention the food at all and chat about other things as you eat. As he is five years old, it can be helpful to use rewards with him. For example, if he tries a new food (even one pea) he gets a star on a chart – the key thing is to get his co-operation rather than be fighting with him. Appreciate his efforts when he tries new foods and encourage him all the way. One advantage of him being five rather than a toddler is that you can reason with him and get his agreement and co-operation around healthy eating. Sit down with him at a good time and explain how important it is for him to eat nutritiously and how you only encourage him because you love him – you wouldn’t be a good parent if you didn’t. Listen carefully to his objections and preferences. Make a list of all the foods he knows and categorise them into “those he loves”, “those he thinks are okay” and “those he doesn’t like at the moment”. It can help to adopt an educational approach and even to fit in with what he is learning in school. For example, when his school is discussing the food pyramid, get him to select a couple of foods he likes from each level of the pyramid. Or when he is learning the importance of eating a “rainbow” of fruit and vegetables for better health, set him the challenge of eating a food from all the colours of the rainbow in one week. When dealing with fussy eating, it is important to put things into perspective. The vast majority of children with restricted diets tend to grow up healthily and well. In the long term, fussy eating tends to fade and children change their eating habits at different developmental points (often influenced by peer groups when they start school or become adolescents). The key is to continue to gently encourage healthy eating choices while remaining patient and keeping things in perspective. John Sharry, Irish Times Newspaper, November 19th 2013.